A simple example of the discrete uniform distribution is throwing a fair dice. The possible values are 1, 2, 3, 4, 5, 6, and each time the dice is thrown the probability of a given score is 1/6. 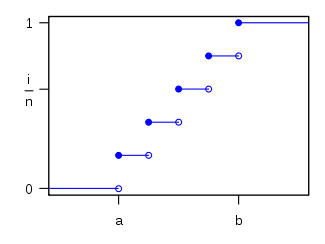 If two dice are thrown and their values added, the resulting distribution is no longer uniform since not all sums have equal probability. This example is described by saying that a sample of k observations is obtained from a uniform distribution on the integers , with the problem being to estimate the unknown maximum N. This problem is commonly known as the German tank problem, following the application of maximum estimation to estimates of German tank production during World War II. where m is the sample maximum and k is the sample size, sampling without replacement. This can be seen as a very simple case of maximum spacing estimation. so a standard deviation of approximately , the (population) average size of a gap between samples; compare above. The sample maximum is the maximum likelihood estimator for the population maximum, but, as discussed above, it is biased. If samples are not numbered but are recognizable or markable, one can instead estimate population size via the capture-recapture method. See rencontres numbers for an account of the probability distribution of the number of fixed points of a uniformly distributed random permutation. ↑ The sample maximum is never more than the population maximum, but can be less, hence it is a biased estimator: it will tend to underestimate the population maximum.